In order to facilitate service providers’ seamless transition to 5G networks, Juniper Networks, Inc. JNPR recently announced a significant boost to its metro, edge and core solutions. The computer network equipment maker’s new solutions, which comprise IP optimized silicon enabling 400GbE density on a new 14.4Tb line card, new ACX access and enhanced MX 5G router portfolio, will likely help operators in transforming their infrastructure in a comprehensive way. For metro solutions, Juniper is introducing an enhanced Metro Fabric portfolio to provide an agile network infrastructure for easier service creation. For edge solutions, the new MPC11E line card in the MX2000 Series 5G Universal Routing Platform, powered by the company’s Penta Silicon, delivers more line card and system capacity with 4Tb per slot capacity for high-capacity edge routing platforms. For core solutions, its new Triton Silicon enables secure connectivity at scale with 400GbE native MACsec support in a networking chip. Notably, the infrastructure developments are expected to deliver an automated and cloud-centric architecture that potentially holds new revenue stream for operators, when combined with Juniper’s Contrail software portfolio. 5G is touted to be the primary catalyst for next-generation Internet of Things services. These include connected cars coupled with augmented reality and virtual reality platform, smart cities and connected devices that revolutionize key industry verticals. However, with these facilities come exponential traffic growth and performance demands along with operational complexity. So, in order to cater to increasing customer demands, operators need to transform their networks to be secure and cloud-ready while delivering varied services in an agile and cost-efficient manner. Despite some short-term challenges, particularly within the cloud vertical and risks related to geopolitical uncertainty, Juniper has been witnessing encouraging developments in most areas of its business. This augurs well for its long-term growth. It has made significant changes to its go-to-market structure to better align sales strategies to each of its core customer verticals. Juniper plans to introduce several new products over the next few quarters, which are expected to stoke its competitive position across service provider, cloud and enterprise market. Offerings include new MX line card that will bolster its ability to capitalize on carrier 5G initiatives. It will also offer a new 400 gig platform, which will improve its ability to capture data centric footprint particularly in the cloud. Juniper further aims to enhance its Contrail Enterprise Multicloud platform that will help its mid to large enterprise customers transition to a multicloud world with increased simplicity and reduced cost. The company believes the 400-gig upgrade cycle, 5G deployment and enterprise multicloud initiatives hold huge opportunities, wherein it is well positioned to benefit over the next several years. 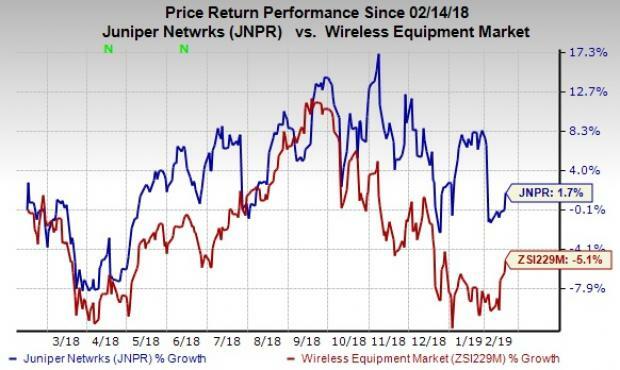 Courtesy of proper execution of operational objectives coupled with such coveted solution offerings, Juniper’s shares have rallied 1.7% on an average against the industry’s decline of 5.1% over the past year. Juniper currently has a Zacks Rank #4 (Sell). Better-ranked stocks in the industry include Comtech Telecommunications Corp. CMTL, Harris Corporation HRS and Motorola Solutions, Inc. MSI, each carrying a Zacks Rank #2 (Buy). You can see the complete list of today’s Zacks #1 Rank (Strong Buy) stocks here. Motorola has a long-term earnings growth expectation of 9.8%.